C-60, Sector 63 Near Fortis Hospital Noida - 201301, U.P. 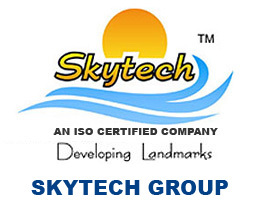 Skytech Group is a progressive and innovative real estate enterprise that thrives on their motto of developing landmarks. The company has contributed some astonishing and well received residential, commercial, hospitality and IT Park projects to the skylines of the NCR especially Ghaziabad, Rohtak and Noida. Being an ISO certified company; it dedicatedly works at delivering quality through thorough commitment. Elevating modern lifestyles since its establishment, the organization has adhered to the principles of contemporary architecture, innovative designs and spaces that are practical and inclusive of all the basic amenities for a comfortable life. The company has always believed in delivering quality through team work. The company employs scores of experienced professionals such as finance experts, architects, engineers, marketers and more. Considering quality, safety and customer satisfaction as its three fundamental principles, the Skytech Group aims to identify themselves in the market place as a customer centric organization that does not compromise on ethics of business and quality. Founded and headed by Mr. Rakesh Chawla, the Managing Director of the Skytech Group, has to his credit an impressive experience of two decades in the real estate sector. It is under his impetus that the company has been able to fulfill and bring to realty the housing dreams of various families with the highest emotional value at competitive pricing.